HOPE, Clifford Ragsdale, a Representative from Kansas; born in Birmingham, Van Buren County, Iowa, June 9, 1893; attended the public schools and Nebraska Wesleyan University, Lincoln, Nebr. ; was graduated from Washburn Law School, Topeka, Kans., in 1917 and was admitted to the bar the same year; during the First World War served as a second lieutenant with the Thirty-fifth and Eighty-fifth Divisions in the United States and France 1917-1919; commenced practice of law in Garden City, Kans., in 1919; member of the State house of representatives 1921-1927, serving as speaker pro tempore in 1923 and as speaker in 1925; elected as a Republican to the Seventieth and to the fourteen succeeding Congresses (March 4, 1927-January 3, 1957); chairman, Committee on Agriculture (Eightieth and Eighty-third Congresses); was not a candidate for renomination in 1956; president, Great Plains Wheat, Inc., of Garden City, Kans., 1959-1963; died in Garden City, Kans., May 16, 1970; interment in Valley View Cemetery. Hope, Clifford. 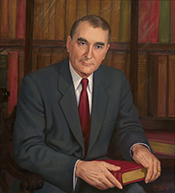 Quiet Courage: Kansas Congressman Clifford R. Hope. Manhattan, Kans. : Sunflower University Press, 1997.